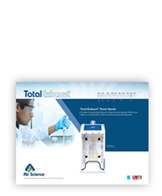 TotalExhaust™ fume hoods are designed to provide superior personnel protection from exposure to hazardous agents and toxic chemicals in a variety of applications. 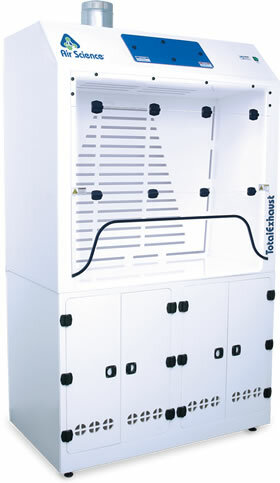 TotalExhaust fume hoods use horizontal and vertical airflow across the work surface to ensure optimal containment. Corrosion-resistant, single-wall units are available in a number of standard and custom sizes with optional polypropylene exhaust blowers to augment external ventilation systems. Contact Air Science for more information. White, black or blue all-polypropylene work surface. Units available with up to four exhaust connection points. Vapor-proof, ballasted fluorescent lighting with switch and power cord. 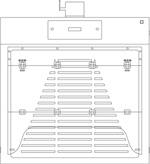 Integrated rear baffle system optimizes airflow and improves containment. Acrylic, bi-fold front sash to ensure operator safety and comfort. Two cable pass through ports provide convenient workspace configuration options. 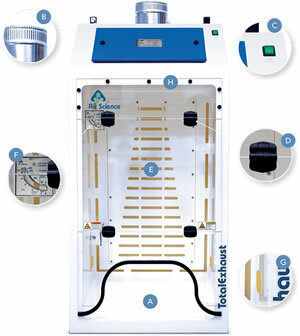 Air Velometer provides continuous airflow monitoring. A. Work Surface: Seamless polypropylene work surface. Stainless steel and epoxy options also available. B. Exhaust Connection Collar: Standard 6-inch exhaust collar (up to 4 connections depending on model). C. Power Switch: On/Off power switch for internal lighting. D. Double Hinged Self Locking Front Sash: Easy to open bi-fold acrylic front sash. Additional construction materials available as options. E. Internal Baffle System: Integrated internal baffle system ensures smooth airflow and optimized containment. F. Air Velometer: Analog air velocity meter allows continuous visual inspection of airflow for operator safety. G. Pass Through Ports: Side-wall mounted pass through ports for safe routing of instrument cords, cables and leads. H. Lighting: Ballasted, vapor-proof fluorescent lighting saves energy and provides optimal internal lighting conditions.